Our spectacular sunset views and tropical waters will make your lunch, dinner, drinks and desserts that much more pleasurable. After eating, mosey through our gift shop where you will find Island apparel with original artwork and our exclusive logo on quality tank tops, t-shirts and sweaters. The mercantile shop is packed with great gift ideas to remember your trip to the Keys or make your friends who didn`t come along jealous. If you are looking to just relax and enjoy the scenery, pull up a bar stool to the longest tiki bar in the Florida Keys. The bartenders are sure to put a smile on your face when you sip on one of their frozen favorites or cold draft beer. Happy Hour is from 3 to 5 PM, seven days a week. After all, this is what you came to the Keys for. Located at Burdines Waterfront, Open 7 Days 11:30 AM Til 9:00 PM Green Chile Cheeseburgers, Fresh Fish Sandwiches (Fried, Grilled, Blackened) Fresh-Cut Fries, Shrimp Basket W/ Hushpuppies & Slaw. We will cook your fresh cleaned catch for you any way you like it. Hot Chips & Homemade Salsa, Cheese Quesadillas, Chiki Tiki Key Lime Pie, and Cold Beer & Wine. The Keys Way to Enjoy your Day! Come by Water or Land. Whole Foods is the largest supplier of organic and natural foods across the country today. Keys Fisheries is proud to supply all Florida Whole Foods with our fresh seafood for Whole Foods Seafood Markets. Located in the heart of the Florida Keys, just North of the 7 Mile Bridge in Marathon, we are centrally located for all visitors to the gorgeous, tropical paradise that is the fabulous Florida Keys. Our Florida Keys seafood restaurant is located on the edge of Florida Bay with gorgeous views and exceptional sunsets on tap for our valued clientele. We are back open and Sparky`s Strong located behind the Holiday Inn Express. We still combine culinary excellence with the Florida Keys on the water lifestyle to create the ultimate dinning experience. Sparky`s is not another cookie cutter keys eatery - it`s Marathon`s best combination of great food and delicious cocktails that embraces both seafaring locals and vacationers alike. Sparky`s Landing was founded in February of 2006 and our focus is good times, fresh fish & refreshing cocktails. Sparky`s is located on the working charter boat fleet docks of the Key Colony Beach Marina. Sunset Grille & Raw Bar opened for business in Marathon, Florida on February 12, 2010. Blessed with the very best location in perhaps all of Florida for enjoying the glorious sunsets and expansive views of the Historic 7 Mile Bridge, the restaurant offers more than just a dining experience. With emphasis on service and food quality, Sunset also offers a great place to relax at our bars and at our giant oceanfront pool. Free to use to our customers, the pool is temperature regulated in all seasons. Our diverse menu offers something literally for everybody, including an awesome sushi menu. Additionally, we offer a World Famous Specialty Drink Menu with specialty cups to take home from volcanos to monkeys to sharks and coconuts! So bring your family, friends, kids, grandparents, and whoever wants to have a great time down to the Sunset Grille. You will not be disappointed! We are known for our good food and friendly island atmosphere. 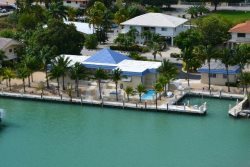 Our unique location has hosted famous Keys visitors and celebrities since the 1950`s, including such notables as Ernest Hemmingway, Jimmy Hoffa and Elizabeth Taylor. Originally known as "Bill Thompson`s Villas and Marina", it was the place to be. We know that it still is! Our BBQ is smoked daily on premises and we offer fresh local seafood. Share a bit of what the Keys used to be.